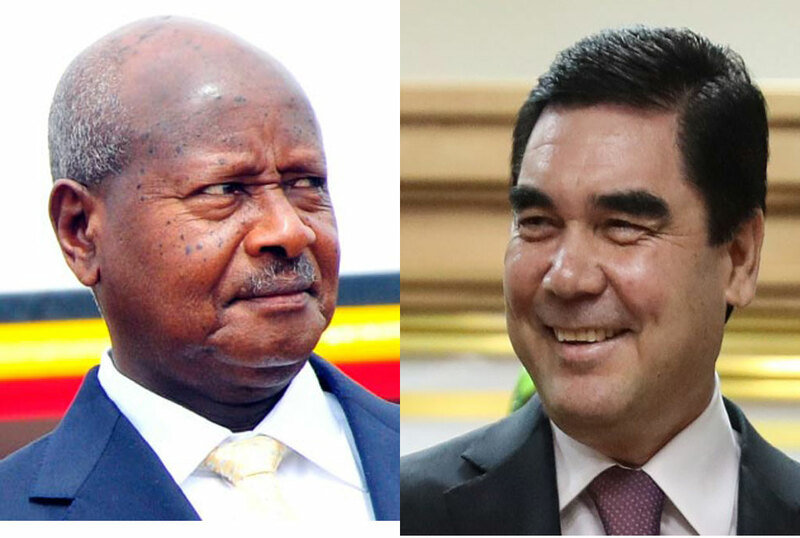 A photo montage showing Ugandan president Yoweri Museveni and Turkmenistan’s President Gurbanguly Berdymukhamedov. President Museveni received immense praise when he released a rap song accompanied with a video during the 2016 presidential elections. The song was not the kind you would describe as a masterpiece but for a second it made many Ugandans think they had a ‘cool president’. But Museveni needs to head back to the recording studio and release another hit as another president has arrived on the ‘Cool Rapping President Gang’. Turkmenistan’s President Gurbanguly Berdymukhamedov, already known for his horsemanship and prolific writing, was on Wednesday shown on state television joining his teenage grandson in a patriotic rap and fist-bump. The tracksuited duo performed a song they reportedly penned themselves praising sport, the beauty of the desert country of five million people and its main beach resort, Avaza on the Caspian Sea. The performance by the ex-Soviet country’s powerful president and his favourite grandson Kerimguly was shown on the tightly-controlled state channel Altyn Asyr. “Life is so wonderful in (my) motherland, my splendid and dazzling Turkmenistan,” the youngster sang hesitantly. The pair were then shown celebrating with a fist-bump and performing a synth pop version of the song. Kerimguly, who is aged 13 or 14 and is the son of the president’s daughter, is a notable exception. Rights groups accuse Berdymukhamedov of heading one of the most repressive and isolated regimes in the world. He took over after the death of his eccentric predecessor Saparmurat Niyazov who renamed months after family members and erected a revolving golden statue of himself. Berdymukhamedov has echoed many of his predecessor’s authoritarian tactics, however, and is also honoured with a golden statue in Ashgabat. The former dentist has written 29 books and ridden in numerous equestrian events, although he famously fell off his horse in 2003 after winning a race. He is currently on a family holiday and the leader and his grandson have been shown on television cycling, playing tennis and working out in the gym. The latest footage may be an attempt to show a more human side to Berdymukhamedov, who is practically deified by national television. The closeness with his grandson is reminiscent of President Alexander Lukashenko of ex-Soviet Belarus who is practically inseparable from his teenage son Nikolai, even on state occasions. Nikolai has also been filmed playing the piano and speaking Chinese.